Muotathal meets Emmental! 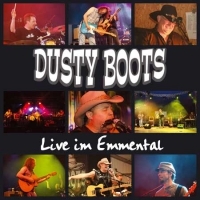 dustyboots-Live-Stimmung für die Stube zu hause! 11 Songs; aufgenommen im Januar 2009 am ICE Rock 2009 in Wasen im Emmental. Restless Kind, Call Me The Breeze, Sidetrack, Walk Softly On This Heart Of Mine, Solo Franz, Midnight Train, Canyon Express, Muotathal Mountain Man, Going Up The Country, Keep Your Hands to Yourself, Feeling Good.